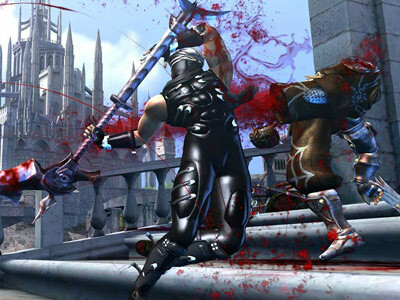 Ninja Blade is so ridiculously over the top, it's hard not to get a kick out of it. In a not-too-distant Tokyo future, evil parasites that mutate their victims and turn them into violent killers spreads havoc. It’s up to you, as an elite G.U.I.D.E soldier and distinguished ninja Ken Ogawa, to tackle the "Alpha Worms" and rescue Tokyo from the worms’ clutches that will make G.U.I.D.E instigate the last resort and nuke the entire city. Of course matters will be worse: your own father has been infected and is now fighting you. A moral conflict that isn't all that moral or conflicting ensues. The character of Ken is so sensationally acrobatic that he makes the three stooges practically mundane. During the course of the game, he'll sky-surf on missiles, perform gravity-defying stunts on a motorcycle, ride a wrecking ball to glory, and what-have-you else that it would even make 007 green with envy. These glitzy, cinematic scenes are laughably ludicrous, and yet they're an absolute hoot to watch and bound to get your pulse pounding.